Seems a server update in November 2018 distorted how Avatar Hover works for Tiny avatars. (BUG-225893) They now float about a foot (0.3m) above the ground. Tinies Protest the Continuing Second Life Hover Bug! The Lindens have found the problem in the change to the Bake Service made in preparation for Bakes On Mesh. The fix is in QA and should roll out ‘soon’. The Tinies pulled off a cute, humorous, and hopefully effective protest. You can read more here, Tinies Protest at Governor Linden’s Mansion. Whether or not the protest was needed… I doubt it. I suspect it bumped the priority for this fix. Posted in General News, Second Life. Tagged Second Life Tech Problems. We are in the holiday season which is synonymous with ‘no-change-window’. There are no user group meetings this week. So, news is limited and mostly non-existent. No Deploys post. Last main channel restart appears to be 12/4. But, one was reported to have happened 12/11… my detector didn’t notice it. And none since. Server and viewer versions are also unchanged this week. Mesh Bodies – Kitsune Shan (URL FB) has a mesh body coming out that is designed to do a good job of portraying thin to chubby with good proportions. Kitsune also makes tutorials. See Skinning Session (URL FB). While the clicks and keys in this video are not universal, the weighting process is. Kitsume also has 2 YouTube channels; Big Channel and Small Channel. Scandalize – If you are into fashion you likely know the brand name. Seems they tried to do a gift card thing for Christmas. It went sideways and didn’t work as planned. They published an apology and a sort of workaround. You can join the |Scandalize| (SLURL) group and get the details from their notices. And you have to be part of the group to get/use the gift cards so… Get it done. Limited time to use the fix. Posted in General News, Second Life. Tagged Mesh Body, Win7. Posted in Changes, General News, Second Life. Tagged Places. Scam – There is a new viewer scam out. No one is quite sure what the scam viewer does. I doubt it is anything you want to find out by experimenting. There are a couple of people taking the viewer apart and looking at the questionable code. You’ll see the first of the scam in an Instant Message (IM). It is a great promo for a new version of the Firestorm PRO Viewer. It promises ‘No Lag’ even on slow connections, instant loading inventory, faster teleports, instant avatar rez, and faster login. Who wouldn’t want this version of Firestorm? But, it is a scam. There is no PRO version of Firestorm. You are sent to a fake Firestorm site FirestormViewer.pro. The real address is FirestormViewer.org. The fake site provides a download with an embedded virus. Most of the big name anti-virus products detect the problem. Posted in General News, Second Life. Tagged Town Hall Meeting. This is coming along nicely. Simon and Oz Linden have started using it in the AGNI grid. You have to have an EEP Viewer to see the change, but, soon the RC viewer will go main and EEP will be an official feature of SL. 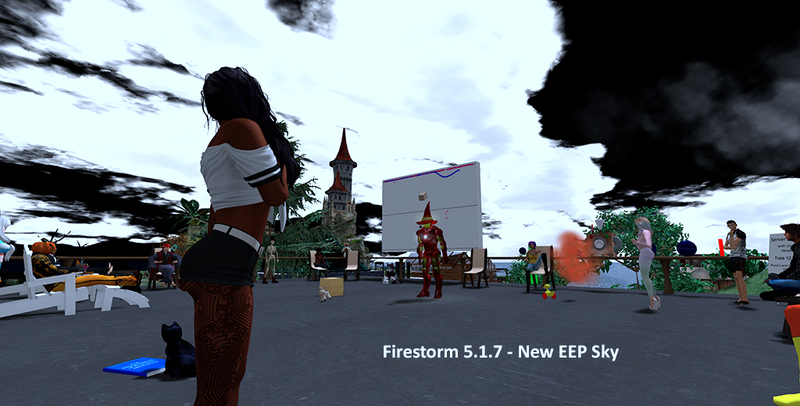 At the Server-Scripting UG meeting I arrived using the Firestorm viewer. The sky looked very different. Using region defaults I got this odd result. At first, I was trying to figure out what I was last doing that messed things up. Then Simon explained what had changed. Switching over to the EEP Viewer I could see the new sky with a pumpkin moon. Posted in Changes, General News, Second Life, SLV2, 3, 4, 5, & 6 Series. Tagged EEP, Windlight.